"This book is game changing in a way I have never seen in a business book. I learned about myself and gained new insights into the work I've been doing for thirty years. It is a spectacular read." This is not a management book. This is a book for managers. There is, and Stan Slap is going to help you get it. You hold in your hands the book that entirely redraws the potential of being a manager. It will show you how to gain the one competency most critical to achieving business impact, but it won't stop there. This book will put a whole new level of meaning into your job description. You will never really work for your company until your company really works for you. 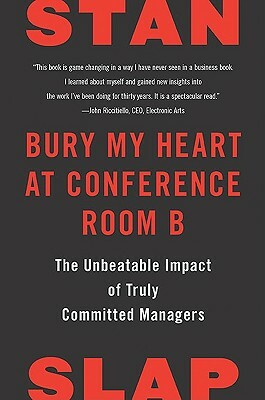 Bury My Heart at Conference Room B is about igniting the massive power of any manager's emotional commitment to his or her company-worth more than financial, intellectual and physical commitment combined. Sometimes companies get this from their managers in the early garage days or in times of tremendous gain, but it's almost unheard of to get it on a sustained, self-reinforced basis. Of course your company is only going to get it if you're willing to give it. Slap proves that emotional commitment comes from the ability to live your deepest personal values at work and then provides a remarkable process that allows you to use your own values to achieve tremendous success. This is not soft stuff; it is the stuff of hard-core results. Bury My Heart at Conference Room B is the highest-rated management development solution at a number of the world's highest-rated companies—companies that don't include "patience" on their list of corporate values. It has been exhaustively researched and bench tested with tens of thousands of real managers in more than seventy countries. You'll hear directly from managers about how this legendary method has transformed their careers and their lives. Stan Slap is doing nothing less than making the business case for a manager's humanity-for every manager and the companies that depend on them. Bury My Heart at Conference Room B gives managers the urgency to change their world and the energy to do it. It will stir the soul, race the heart, and throb the foot used for acceleration. Buckle Up. We're Going Off-Road. Slap is smart, provocative, wickedly funny and heartfelt. He fearlessly takes on some of the most cherished myths of management for the illogic they are and celebrates the experience of being a manager in all of its potential and potential weirdness. And he talks to managers like they really talk to themselves. Stan Slap has revolutionized performance for some of the world’s most demanding organizations. His international consulting company, slap, specializes in achieving ferocious commitment in manager, employee and customer cultures––the three groups that decide the success of any business. His client list ranges from Hewlett Packard and Microsoft to HSBC and Viacom. When he’s home, he lives in San Francisco. "The notion that values matter--in the workplace as well as at home--is certainly not new to the ranks of management gurus and corporate leaders. What are novel in consultant Stan Slap's first book are his passion for the subject, which bleeds from every page, and his easy-to-use framework for identifying and promoting values throughout the business world. Setting the stage, first, involves explaining the business case for values: why everyone must live their personal values in the workplace and which companies adhere to that philosophy. In sidebars, Slap tells the stories of EMC, HP, Rhino Records, SAS, Quad/Graphics, and others that showcase the bottom-line impact of managerial emotional commitment. Next, then, are the value exercises: the list and definition of 50 values and the winnowing to ten, five, and, finally, three. As to be expected, the author leads us to organizational implementation, focusing on the selling of values to staff and, ultimately, to the C-suite. In a passion- infused narrative, Slap gives every manager the tools to change. Now, if it will only stick!" "I urge you to follow where Stan Slap fearlessly leads us. He has the answer to making a career in management actually bring you a fuller, richer, better life." "A subversively radical triumph of a book which uniquely and definitively demonstrates the mystery of how organizations succeed." "Slap has written the holy grail for companies seeking the most from their managers and for managers seeking the most from their companies. It is fascinating, thought provoking and actionable. This book is not just a "must read" but a "must experience." "This book has the answer for any manager who thinks there must be a better way to do the job without hating the job. The single most powerful management book I've read in years." "Stan Slap's approach for developing managers who care resonates deeply with the principles we at Four Seasons strive to embody. There are great insights here for creating a true culture of ethics, integrity, and heartfelt service." "Whether you are a first time supervisor or a CEO, reading this book will allow you to tap into the secret that will drive organizational success." "You have to read Bury My Heart at Conference Room B. Stan Slap covers all the bases. A warm, witty book that will take you and your organization to a better place." "Humanity in any organization, whether professional or political, is what will save us. The world needs this book."